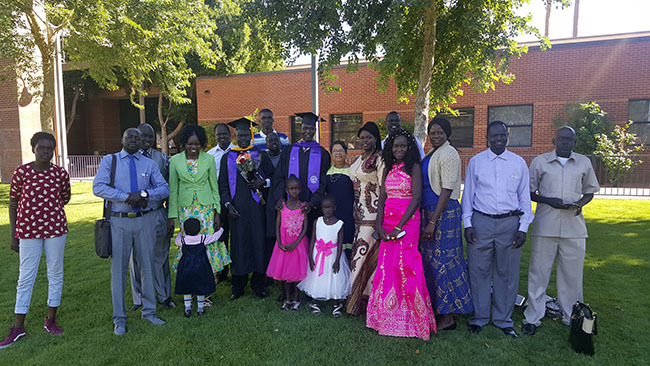 Bol Bior Kur (tallest graduate in middle) poses with his family after commencement. True to her ideals, she quickly made it her mission to find out why they were there and, more to the point, why they needed a ride. They were part of the 20,000 “Lost Boys of Sudan” who had fled the African nation to escape the mass killings in a brutal civil war that killed 2.5 million people and displaced many more. They were getting to church by city bus and invariably would arrive late, so they respectfully sat in back and just tried to assimilate as best they could. Bell, who says she didn’t even know about the plight of the “Lost Boys” before that, started driving them there herself in her little Chevrolet Cavalier — three of them shoehorned in back, the other crammed into the front seat next to her. The fact that they’re all tall made it quite a sight. “We looked like the clowns at the circus,” she says. But Bell was determined to be more than just a chauffeur. Are you kidding? 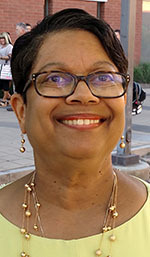 Even though she lived alone, she took the necessary classes to become a foster parent and adopted all four of them, and Friday morning she got to see one of the fruits of her labor when Bol Bior Kur got his master’s degree in Public Administration from Grand Canyon University. Many online students have incredible stories to tell about how they achieved their dream degree, but Kur’s journey from Sudan to Phoenix to GCU is one for the record books. The start of it alone would be too much for most people. The war broke out when he was 4 years old, and not long after, when the fighting had reached his town and it no longer was safe, he and two other young boys slipped away and walked to Ethiopia. Think about that for a second. That’s more than a thousand miles, and it’s not as if they were traversing flat, paved roads. It’s brutal country in the wilds of Africa with little infrastructure. Now imagine a first-grader doing that. Oh, and one other thing: Many of the Lost Boys traveled with nothing more than the clothes they were wearing. After more than a decade in refugee camps, he was among 4,000 Lost Boys who came to the U.S. in 2000. He still remembers the date he arrived in Phoenix: Dec. 21. Even after Bell adopted Kur, who was 18, and another boy the following June (two more would follow), there were considerable challenges. The first one was communication. The boys spoke little English, so she communicated with them as if it was a game of charades — they would point to things, or the boys would use a dictionary to translate from one language to the other. “We encouraged as much English as possible,” she says. But in Kur’s case, there was another communication obstacle: He had a severe stutter, and she had to get him into speech therapy right away. She also enrolled them in Deer Valley High School and credits the staff there for helping Kur considerably with his speech. And now here he was Friday, adding his master’s to the bachelor’s in Business Administration he already had from GCU. He wound up at GCU because his cousin lives nearby, and after driving past the campus so many times he decided to find out more about it. “GCU is one of the best schools, I can say. All the faculty, the teachers, the counselors, they were very good. I could talk to my adviser whenever I need something. They helped me a lot,” he says. He also got help from Arizona Sen. John McCain when visa issues were preventing him from bringing the woman who would become his wife, Elizabeth, to the U.S. from Kenya. McCain made it possible. Bell has seen Kur’s determination in action many times. “He was always a go-getter. It doesn’t surprise me that he’s gone this far,” she says. He even overcame a 14-day stay in the hospital, which delayed his graduation by six months. “Now that’s what you call determination,” she says. And yet, despite all this, despite the incredible journey that started with running for his young life, she remains flabbergasted by the way he just takes things in stride. Of course, maybe all those horrific challenges are why another college degree is just another accomplishment, in his view. Every commencement story is a big deal, of course, and every graduate has a story to tell. Some more than others. And some just make you wonder how they ever did it — how a Lost Boy found his way and never stopped moving forward despite the odds. This time, the statistics didn’t win. But it takes people like Pat Bell to stop all those negative numbers from adding up. God Bless you Pat Bell. You defiled the statistics of fate and made their story outstanding. May their success continue to bring you fulfillment. God bless you Bior Kur, and God bless you Pat for your big heart. 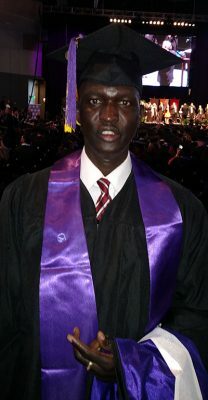 I am from kenya and I graduated from GCU in 2002. I cannot help being touched by this story because I remember the lost boys coming to Kenya from neighboring Sudan. I remember crying and praying that God would intervene. Today I am so happy to see what God has done in your lives! May God continue to bless you mightily!